Note : The Evening will be “gone fishin’” until January 2, 2018. Happy Holidays to all! 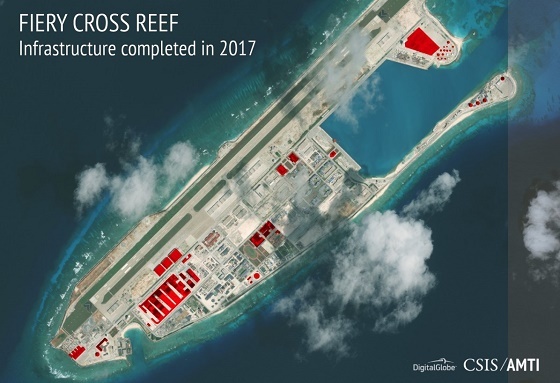 According to a new CSIS Asia Maritime Transparency Initiative analysis based on satellite imagery, China has built more infrastructure on artificial islands in the disputed South China Sea in the past year, including underground tunnels and radar installations, even as it has sought to repair relations with other claimants, as the Wall Street Journal’s Jeremy Page reports. Dive Deeper : See CSIS’s interactive Asia Maritime Transparency Initiative (AMTI) micro-website. The Federal Communications Commission swept aside rules barring broadband providers from favoring the internet traffic of websites willing to pay for speedier service, sending the future of net neutrality on to a likely court challenge, as Bloomberg reports. Dive Deeper : See AEI’s “After the vote: What’s next for the Restoring Internet Freedom Order." Russian president Vladimir Putin said today that the United States was in the grip of a fabricated spymania whipped up by President Donald Trump’s opponents, but he thought battered U.S.-Russia relations would recover one day, as Reuters reports. Dive Deeper : Listen to the CSIS Kremlin Playbook podcast on “Countering Russian Interference” on Apple Podcasts or here. And see “Putin’s Plan for Syria” by Carnegie Moscow’s Dmitri Trenin for Foreign Affairs . U.S. ambassador to the United Nations Nikki Haley, standing before military debris that she claimed to be of Iranian origin, offered Thursday what she presented as “indisputable” evidence of Iran’s UN resolution-violating actions in the Middle East, as Politico’s Louis Nelson reports. Senator Lindsey Graham (R-SC) said there is a 3 in 10 chance that the United States will use a military option if North Korea conducts another long-range ballistic missile test. — Vladimir Putin commenting on Donald Trump’s first year in office during his annual end-of-year press conference in Moscow today. Source: CNN . In the South China Sea this past year, Beijing carried out most of its construction in the disputed Spratly Islands. This photo of Fiery Cross Reef shows the significant infrastructure upgrades covering about 110,000 square meters. (Photo Credit: ALEXANDER NEMENOV/AFP/Getty Images.) 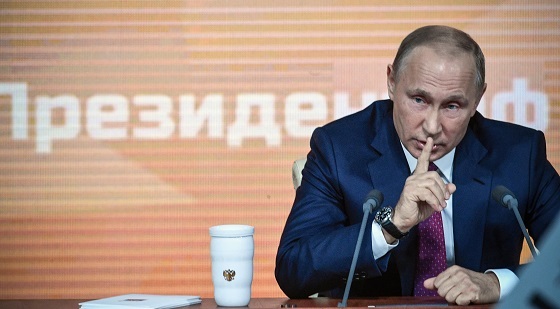 Russian president Vladimir Putin during his annual press conference today in Moscow. On Monday, join the CSIS Simon Chair at 9:00 a.m. for a conversation and presentation series comparing Chinese and Western approaches to infrastructure investment. In the summer of 2017, a team from the CSIS Global Food Security Project traveled to Kenya and India to explore how policies shape agricultural development. Yesterday, CSIS hosted the launch of the resulting report, The Human Face of Trade and Food Security. The Kremlin Playbook podcast miniseries released a new episode this week, “Countering Russian Inference,” on the options the United States has to counter influence in our elections. Available on Apple Podcasts or SoundCloud. This is such a joyous one for me. You see, it was announced yesterday that Dire Straits will be inducted into the Rock and Roll Hall of Fame in the 2018 class. Now I just need Little Feat, the Meters, Delaney and Bonnie, and a few others to get inducted. Dire Straits, as we have discussed in this smiling space, clearly belong in the Rock Hall. They’ve sold over 100 million albums worldwide.